As a small business owner, with Appointfix, you have a number of very useful strategic features to manage your appointments and send the best text message reminders to your clients. Here’s some inspiration for hairstylists, barbers and beauty industry professionals. Specific reminder templates – ready to use text messages – to inspire you as you set your friendly text message reminders for your salon clients. As announced here, up until now you had just one template for the reminders that were sent to your clients. With our latest update though, you can now define and use different messages. What’s also new and helpful is that you can send a message even after the appointments to create a better relationship with your clients and build customer loyalty. 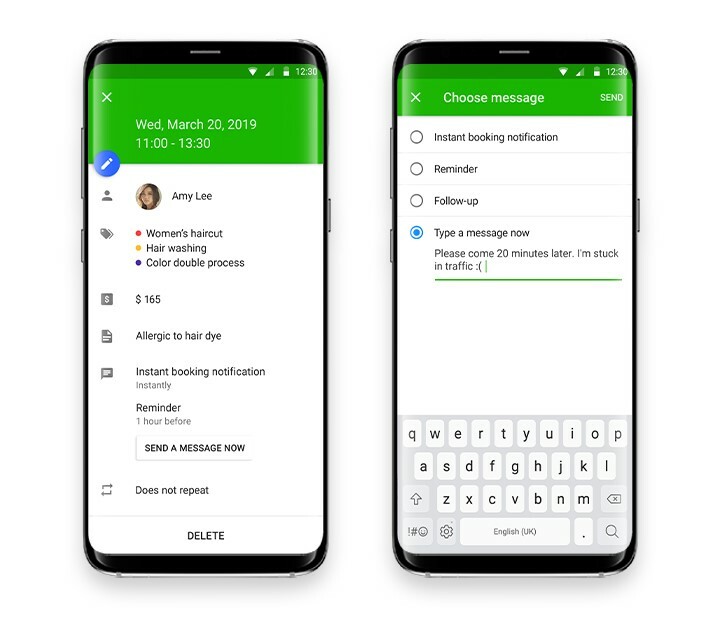 Instant booking notification – for the moment when the appointment is created, the message goes out to your client confirming a successful booking of their appointment. Follow-up – a text message to thank your clients for their salon visit and give further instructions after the appointment. Depending on your personality type and your sense of humor, whether if you’re very friendly with you clients or prefer to be more formal, you can choose from the following a reminder templates to create great appointment text messages for your clients. Decide and set the messages that will be sent as automated reminders to your clients from your Appointfix app. Some messages are more serious and formal, others more relaxed, friendly and fun. You can employ the ones you like, or simply use these as guidelines when you’re creating your own personalized text messages for your dear clients. Hi beautiful, your appointment was booked. Lisa/Butterfly Studio will be delighted to serve you on DATE at START TIME. See you soon! Dear CLIENT’S NAME, this is a reminder from Lisa/Butterfly Studio about your appointment on DATE at START TIME. If you need to reschedule, please call PHONE NUMBER. Hi there! A quick message from Lisa/ Butterfly Studio to say your appointment was successfully booked. See you soon! Hi CLIENT’S NAME, this is a reminder from Lisa/Butterfly Studio about your appointment on DATE from START TIME to END TIME. Look forward to seeing you! Hola! Your appointment with Lisa/ Mariposa Studio in on DATE at START TIME. Saludos & see you soon! Aloha! Lisa/ Butterfly Studio here, confirming your appointment on DATE at START TIME was booked. See you soon, beautiful! Hi, this is Lisa/Butterfly Studio confirming the next opportunity to serve you is on DATE at START TIME. See you soon! Hello CLIENT’S NAME, a wonderful hair transformation will take place at Lisa/Butterfly Studio on DATE at START TIME. You’re appointment is booked and you’ll be the star! Then you can send a different message when the appointment is coming up (a day, an hour in advance, etc). Dear CLIENT’S NAME, this is a reminder from Jessica at Butterfly Salon about your appointment on DATE at START TIME for a SERVICES. If you need to reschedule, please call PHONE NUMBER. Prefer 48 hours for rescheduling or cancellations. See you soon! Dear CLIENT’S NAME, this is a reminder from Jessica at Butterfly Salon about your appointment on DATE @ START TIME. If you need to reschedule, please call/text PHONE NUMBER. No call/no show $25 required to reschedule. Just a reminder from Jessica at Butterfly Hair about your appointment on DATE at START TIME. To reschedule, please call 777-777-777. Dear CLIENT’S NAME, this is a reminder from Jessica at Butterfly Salon about your appointment on DATE at START TIME. If you need to reschedule, please contact 777-777-777. FYI – we do not accept gratuity via credit card. Thank you & see you soon! Just a reminder from Jessica at Butterfly Studio about your hair appointment on DATE at START TIME. To reschedule text 777-777-777. Dear CLIENT’S NAME, this is a reminder from Jason at Barbershop Top about your appointment on DATE from START TIME to END TIME. If you need to reschedule, please call 777-777-777. Hi CLIENT’S NAME! A reminder from Jason at Barbershop Top about your appointment on DATE from START TIME till END TIME. If you need to reschedule let me know. Thanks! More details plus pictures about the technical characteristics here. How many characters should your reminders have? You can decide on your message reminders length, being aware that it will consume one or more text messages out of your data plan. A normal text message contains 160 characters. More specifically, that is 160 text characters (letters, numbers, punctuation signs and spaces), but with no emojis included! The total character size of the messages containing emojis or Unicode characters is only 70 characters. So please take this into account when setting your reminder message templates. The colored fields of the Appointfix reminder templates in the app are dynamic and they will be filled with the needed info (date, time, name, company, phone, etc. ), which also consumes characters. That is why many clients tend to use the very basic format: “Just a reminder from <Your Name or Company Name> about your appointment on <Date> at <Start Time>. For rescheduling call <Phone Number>.” For more details on reminders length and other FAQs, check out this article on Appointfix practical questions and answers. If you’re a hairstylist, barber, hairdresser, cosmetology student and you’re not using an online salon appointment book yet, or a mobile app scheduling software to manage your appointments, check out this free appointment scheduling mobile app. Download Appointfix – also called The Modern Appointment Book – to have everything perfectly organized on your phone and tablet. Your phone is the digital appointment book you always have with you. It’s the best way to easily schedule appointments and reduce client no-shows using automated text message reminders. It will surely make your life easier and your clients happier! A win-win situation. Plus the basic version of the app is absolutely free! For more advanced features, you can check out the very affordable prices here. You’ll be surprised how much you will get, for how little! As some clients confessed, with Appointfix is like having a full time secretary doing your appointments for you for the price of a couple McDonald’s Big Macs per month. In order to get a feeling directly from our app users, see for yourself what our clients are saying. You can check Appointfix online stores reviews on the App Store and Google Play, as well as read our customer’s feedback here and here.